Some of the Members at the Studio session with our Tutor David, third from left. 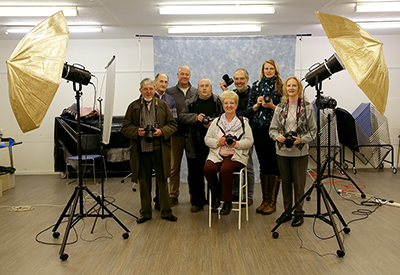 Members met on Monday 22nd January for a practical session on the use of Studio Flash lighting for portraiture. To demonstrate the various set ups we had asked David Morton from Wellington to be our Tutor for the evening. He had planned to bring along one of his models but unfortunately she was not well enough to come. Not to disappoint us, David asked several members to act as models and Stuart, Annabelle and Cherrie filled the role with enthusiasm. Various lighting set ups were explained and members had the opportunity to engage with the model on a one to one which proved to be great fun. By the end of the evening many hundreds of images had been made and a lot of new techniques had been learnt and technical issues resolved by our tutor. Everyone agreed it had been a very worthwhile event thanks to David's knowledge and help.